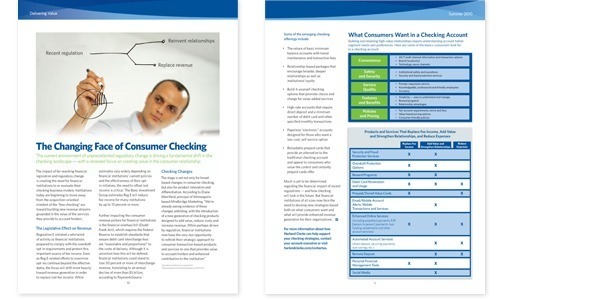 "The Changing Face of Consumer Checking"
Delivering Value was a quarterly digital and print news magazine that featured articles and content of relevance and value to the financial services industry. This story explored ways financial institutions could respond to regulatory change while protecting and replacing checking account fee income. Reinforced Harland Clarke’s depth of understanding and knowledge of the challenges facing banks and credit unions during a period of much change in the industry.